“Creating a Mosaic Sphere for your garden”, with Sitara Morgenster. Two-day workshop making a mosaic garden sphere/”gazing ball”. Sign up for my newsletter to be the first to receive updates on the next available workshops. “Making mosaic X-mas decorations”, with Sitara Morgenster. One-day workshop making mosaic X-mas decorations. Various dates in November. Sign up for my newsletter to be the first to receive updates on the next available workshops. “Making mosaic pendants”, with Sitara Morgenster. 3-HOUR WORKSHOP making your own mosaic pendant(s). We will be creating one or more mosaic pendant(s), at once learning how to cut, design, adhere and finish mosaic tesserae to a zinc-alloy jewellery base, while adding a unique fashion statement to our collection of accessories! Also brilliant as special gifts or X-mas present. Small groups of 6 max. so make sure to book early. . Sign up for my newsletter to be the first to receive updates on the next available workshops. “Mosaic furniture workshop”, with Sitara Morgenster. Upcycling furniture using picassiette mosaic techniques. New dates & locations will be set for 2019, get updates by signing up for my newsletter. “Basic mosaic art magic”, with Sitara Morgenster. New dates & locations will be set for 2019, get updates by signing up for my newsletter. 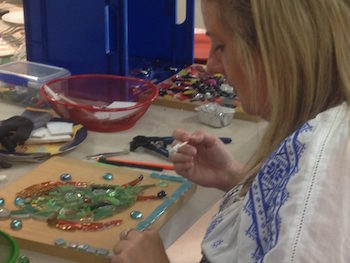 “Making a mosaic mirror”, with Sitara Morgenster. Two-day workshop creating a magnificent home decor addition for your hallway, bath- or bedroom. New dates & locations will be set for 2019, get updates by signing up for my newsletter. “Creating mosaic pavers for the garden”, with Sitara Morgenster. One-day workshop. New dates & locations will be set for 2019, get updates by signing up for my newsletter. If you wonder what one of those workshops might look like, here’s a glimpse from the one in Kerikeri on the 7th of March. Or head over to my facebook page for a photo impression!